I(2 + 1) = 6 volt where ‘I’ is the current through the batteries. [Note that the voltmeter will draw negligible current (ideally, zero current) and hence the same current flows through the batteries]. Therefore, I = 2 ampere. The voltage across the voltmeter is the same as the terminal voltages of the batteries. If you consider the 18 volt battery, its terminal voltage is 18 – (2×2) = 14 volt. [If you consider the 12 volt battery, its terminal voltage is 12 + (1×2) = 14 volt, which is the same as the above value]. So, the correct option is (d). The condition depicted in the above question occurs when the internal resistance of each cell is equal to the external resistance. The answer therefore is 1 Ω. The proof is simple: Let there be ‘n’ cells. If the emf of each cell is V and the external resistance is R, the current through R on connecting the cells in series is nV/(nr + R). When the cells are in parallel, the current through R is V/[(r/n) + R]. Since the currents are equal, nV/(nr + R) = V/[(r/n) + R]. Therefore, r + nR = nR + R, from which r = R.
Once you realise that C and D are equipotential points with respect to point A, the resistance R connected directly between C and D can be ignored (since it will not carry any current). The current through the path AFCEB is therefore V/2R. This may appear to be a difficult question for some of you. In questions of this type try to identify equipotential points. Circuit elements connected between equipotential points can be ignored. In most cases the circuit will then become simple. In the present case, the junction between C1 and C6 is at the same potential as that at the junction between C2 and C5. [This follows since the capacitors are identical. Generally, the points will be equipotential points if the balance condition for Wheatstone bridge is satisfied: C1/C6 = C2/C5]. The capacitor C3 connected between the equipotential points can therefore be ignored. (i) Series combination of C1 and C6 giving a capacitance C/2. (ii) Series combination of C2 and C5 giving a capacitance C/2. (iii) Capacitor C4 of value C.
The parallel combined value of the abve three connections is (C/2) + (C/2) + C = 2C. (2) In a circuit, capacitors C1 and C2 (in series) are connected between two points A and B (Fig). If the potentials at A and B are V1 and V2 respectively, what is the potential at the junction point P between C1 and C2 ? Since the capacitors are in series, they carry the same charge. 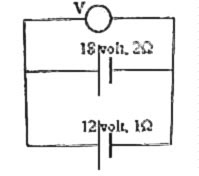 If the potential at the junction point P is ‘V’, the charges on the capacitors C1 and C2 are respectively C1(V – V1) and C2(V2 – V). V = (C1V1 + C2V2)/ (C1 + C2). You can find more posts on electrostatics by clicking on the label ELECTROSTATICS below this post or on the left side of this page. P×5V + 10P×V = P’×6V, since the total volume is 6 V.
From this, P’ = (15/6) P.
where V1 and V2 are the volumes of the gas in the two parts respectively. From the above equations, we obtain V1 = 2V and V2 = 4V [Option (a)]. (2) A Carnot engine with sink’s temperature at 17º C has 50% efficiency. By how much should its source temperature be changed to increase its efficiency to 60%? We have efficiency η = (T1 – T2)/T1 where T1 and T2 are the temperatures of the source and sink respectively. 1– (290/T1) = 0.5, from which T1 = 580 K.
1– (290/T1') = 0.6, from which T1' = 725 K.
Therefore, the change in source temperature = 725 – 580 = 145 K.
Oxygen is diatomic and hence its molar specific heat at constant volume is (5/2) R (corresponding to 5 degrees of freedom). Helium is mono-atomic and hence its molar specific heat at constant volume is (3/2) R (corresponding to 3 degrees of freedom). Therefore, the total quantity of heat required to raise the temperature of two moles of oxygen and eight moles of helium through 1 K is 2×(5/2)R + 8×(3/2)R = 17 R.
Since the number of moles in the mixture is 10, the effective molar specific heat of the mixture is (17/10)R = 1.7 R.
The figure is not given here. You will find it with the post dated 9th August 2007 by moving a little down on this page. If ‘x’ is the maximum possible amplitude, the maximum restoring force exeretred by the spring is Kx and the maximum acceleration of the two blocks (while moving together) is Kx/(M+m). Therefore, x = μg(M+m)/K = 0.2×10(1+0.2)/24 = 0.1 m = 10 cm. 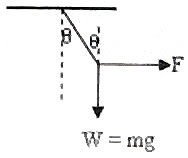 In the case of the rough inclined plane, since the net force acting on the block is (mgsinθ – μmgcosθ), the acceleration of the block down the plane is g(sinθ – μcosθ). Therefore, μ = [(n2 – 1) /n2] tanθ. Try to solve the above problems. I’ll be back with the solution shortly. 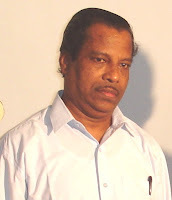 The following questions appeared in KEAM 2007 (Engineering) question paper. Questions of this type are often found in various Medical and Engineering Entrance examinations and other similar examinations such as AP Physics Exam and GRE. where F is the horizontal force, W is the weight (in newton) suspended and θ is the angle made by the rope with the vertical. [ Note that the tangent law follows from the law of triangle of forces]. In the present case, F = 50 N and W= mg. Even if you take the value of ‘g’ to be approximately equal to 10 ms–2, you will arrive at the answer. Thus W = 6×10 = 60 N so that tanθ = 50/60 = 5/6. Even though you are not allowed to use physical and mathematical tables at the examination, you can arrive at the correct option as 40º since you know that tan 30º = 1/√3 and tan 45º = 1. If P and Q are the two forces, we have P + Q = 18 N so that P = 18 – Q.
Q = √(P2 + 122) = √[(18–Q)2 + 122], from which Q = 13 N.
Therefore, P = 18–13 = 5 N.
The correct option therefore is (c). 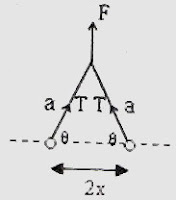 The horizontal force on each particle is T cosθ = Fcosθ/2sinθ = F/2tanθ. This is a simple question which you can answer in no time if you have understood the property of inertia. In fact, by repetition this question has become a ‘knowledge’ type even though it is supposed to be an ‘understanding and application’ type. If you pull the cloth out abruptly in the horizontal direction, the dishes will remain intact on the table. Because of inertia, the dishes cannot move sideways immediately and will touch the bare surface of the table where they will rest as before. Statement-2 is Newton’s third law which is not the reason for statement-1.